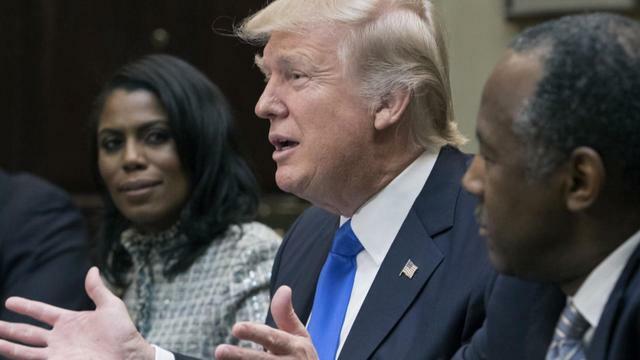 President Trump tweeted Monday night that a long-rumored tape of him using a racial slur on "The Apprentice" doesn't exist, despite former White House staffer Omarosa Manigault Newman's claims to the contrary. The president says he received a call from television producer Mark Burnett, who created the reality show, assuring him there is no such tape. According to excerpts of her forthcoming memoir released to The Guardian, Omarosa said Mr. Trump used the "N-word" repeatedly during the taping of "The Apprentice" prior to his presidency, and she claims there's a recording of him using the slur. The Guardian also notes that Omarosa doesn't write in the book that she has ever heard him say the word, either on tape or in person. But in an interview Friday afternoon with NPR, Omarosa appeared to contradict her own book, saying she's heard the tape on which Mr. Trump said the N-word. On Sunday on NBC's "Meet the Press," she said she only heard the tape after her book had gone to press. On Monday night, a Department of Housing and Urban Development official who says she's known and worked for Mr. Trump and his family for more than a decade came to his defense. Lynne Patton, who is African-American, issued a statement saying she "was the closest confidante & friend to Ms. Manigault-Newman during her tenure at the White House, Transition and Campaign." Patton says Omarosa called her the night Omarosa was fired from the White House claiming she'd quit -- and alleging she'd heard a second-hand tape of Mr. Trump using the slur. Patton says Omarosa named the person who'd played the tape for her. But, Patton continued, that person denied to Patton ever having such a tape. Patton adds that Omarosa said on the MSNBC program "Hardball" Monday night that the source of the original tape was former "Apprentice" producer Bill Pruitt who, Patton says, denied to Patton before "Hardball" had even finished airing that he ever had such a tape. Former Trump campaign spokesperson Katrina Pierson also backed the president, saying in an interview with Ed Henry on "Fox News @ Night" that she "absolutely" hasn't heard him use the N-Word and Mr. Trump and his family "have been nothing but kind, generous and respectful" to the people of color she knows. Pierson criticized Omarosa throughout the interview, calling her book a "desperate" ploy for money and labeling it "trash for cash." But new audio obtained by CBS News and released of a phone call with Pierson, Patton and campaign communications director Jason Miller reveals the campaign staffers discussing how to deal with the potential fallout from the "N-word" tape's release. Omarosa's book is published by a division of Simon & Schuster, which is a division of CBS Corporation. Omarosa will appear on "CBS This Morning" Tuesday at 7 a.m.